If Universal Pictures UK were trying to make a big impact on the UK Anime Community with their debut release of Seraph of the End – Season 1 Part 1 then it’s safe to say that their hardwork will pay-off; as this Collectors Edition is the best Collector’s set I have ever seen and today we will be taking a closer look at it in our latest unboxing. 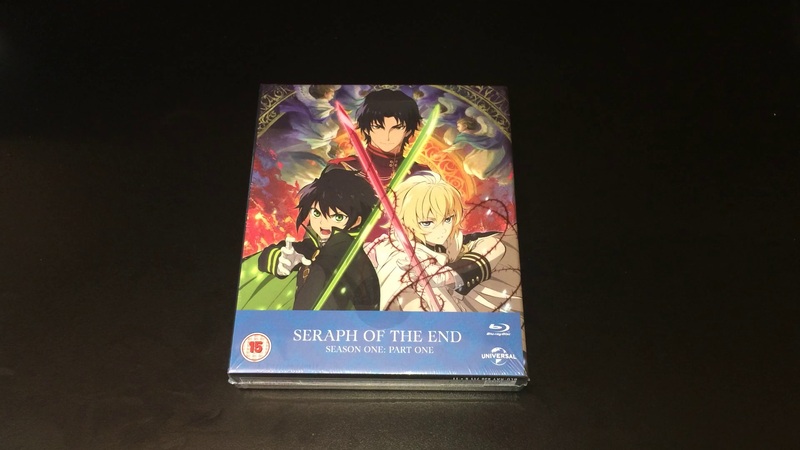 Let’s start at the beginning; this Collectors Edition Blu-ray release of Seraph of the End – Season 1 Part 1 features the first half of season 1, which consists of twelve episodes, across two Blu-ray discs packaged carefully together with a 134-page booklet, which features detailed information on the series as well as a selection of artwork, a selection of character artcards, four character information trading cards and a large-sized poster all of which are compiled together inside a rigid chipboard artbox that actually feels special rather than mass-produced. It’s a bizarre situation whereby the presentation and packaging of the set even feels special before you even get chance to take a look at the items in question. How exactly is this achieved? mostly through presentation. The artbox, and it’s content, do not feel like the traditional materials we’ve become used to with Anime Limited or Animatsu releases and as such it gives this product more of a weight, or an identity, to it; for instance the chipboard artbox – and the artbook – are not glossy but are instead printed materials so they have a soft rubber-styled-realistic feel to them. That’s probably not the correct way of explaining it; but once you get your hands on the product you’ll soon realise what I am referring to. On the other hand the presentation of the discs, and it’s digipack box, are pretty much what one might expect to receive – with the digipack sleeve containing artwork on both sides (and inside behind the discs) while the disc themselves replicate the layout seen on other Universal products, such as the Suits, Fast and Furious and so forth. The postive aspect of this is that Universal Pictures opted to place some nice artwork on the discs as usually their disc artwork can be rather bland and over-crowded with logos; but fortunately enough that is not the case here. 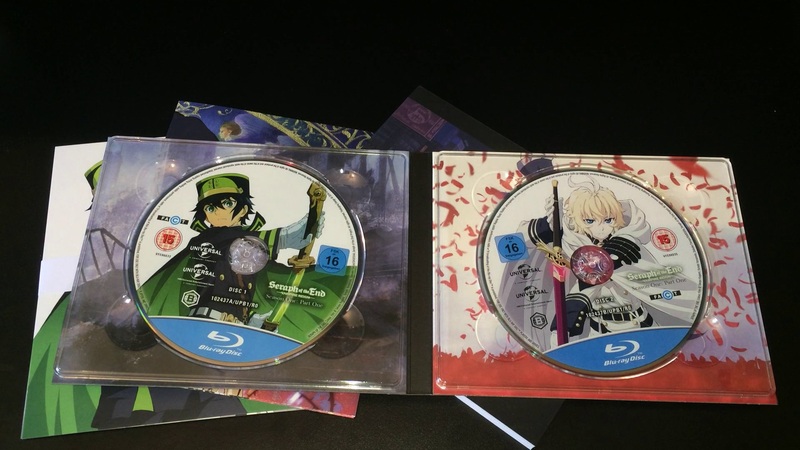 The discs also contain six episodes each, with some on disc bonus content, as well as audio language support for English, Japanese, French and German – each of which are played out in traditional Universal form as you will find out in our unboxing video. 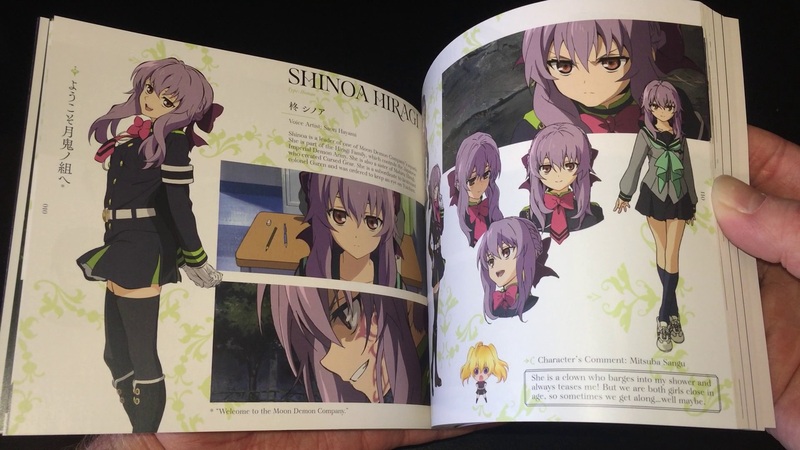 Moving away from the disc content and you will find yourself with the 134-page artbook, the collectable art-cards, character info cards and the poster. The collectable cards, character info cards and poster are all pretty much self-explanatory; but the character info cards – of which four are included – are worth noting due to the more ‘personal’ information being on display, such as age, birthday and dimensions. Basically its pieces of information you would’nt usually find unless you went looking; and yet here it is carefully laid out before our eyes; so it is a really nice touch. The next talking piece of this Collectors Edition set is non-other than the artbook or more accurately the booklet. To some these booklets are worthless, and in some cases they can be, but with this booklet some care and consideration has been taken; as it has been crammed to the brim with useful character information, Q&A sessions with various characters, character artwork and background artwork. Basically it contains a wide variety of information that I personally did not expect to see and it would make a fine read for someone who truly enjoys the franchise or wants to know more about it; and thats me included. The result of all this presentation, packaging and content? A Collectors Edition set that is not only worthy of purchase but its worthy of staying in your collection forever; personally this is how Collectors Edition sets should be done and my only complaint is that it should have been done a lot sooner. 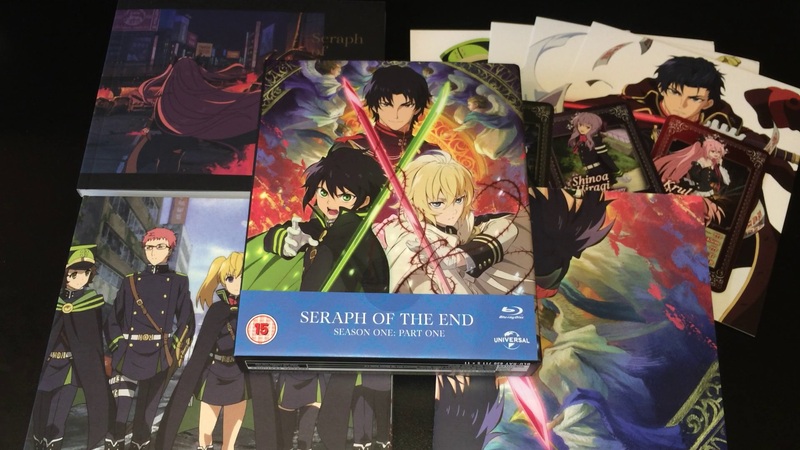 Seraph of the End – Season 1 Part 1 will be available as a Collectors Edition Blu-ray, and a Collectors Edition DVD, on the 23rd May 2016 with pre-orders now being accepted across various retail outlets; including Amazon UK and Zavvi.